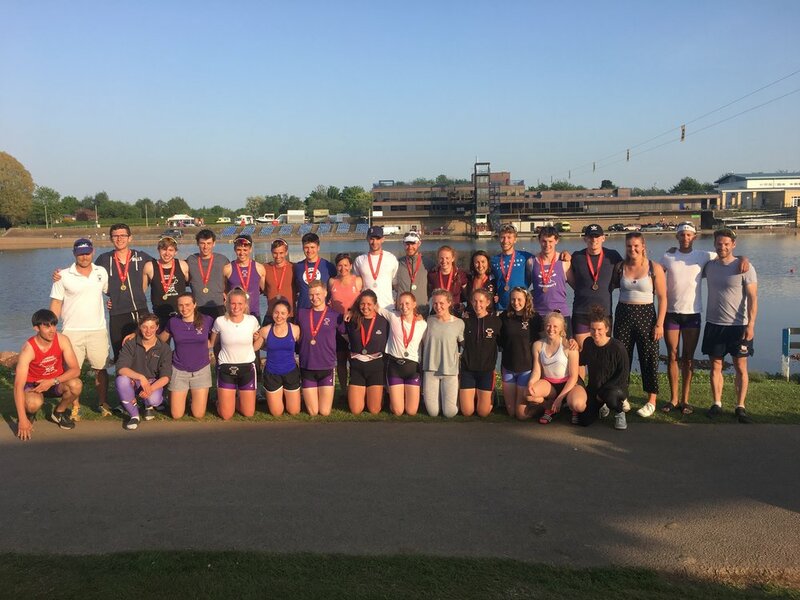 Fifth in the overall Victor Ludorum, twenty A finals and twelve medals in total including five golds made BUCS Regatta 2018 one of our most successful in recent years. The medals began nice and early on Saturday with our lightweight men’s singles. Sean O’Mahony won our first medal of the day with a gold in the intermediate lightweight single which Franklin Hamilton quickly followed up with a silver in the champ lightweight single. Also racing in singles were our heavyweight men and beginner woman. Olly Dix raced well but sadly missed out on the A final of Champ Singles and Luke Reiser placed fourth in the A final of the intermediate single. Kate Rice in her first ever race placed sixth in the A final of women’s beginner Singles, an admirable result for the new sculler. Racing in quads on the Saturday were the heavyweight women and the beginner men. First up was the beginner quad of Alex Crane, Joel Keeble, Ed de Boehmler and Lesh Lethbridge who placed fifth in the A final. Later, the intermediate women’s quad of Sophie Lewis, Bea Roe, Hettie Horler and Emily May came away with a bronze after a gutsy race. 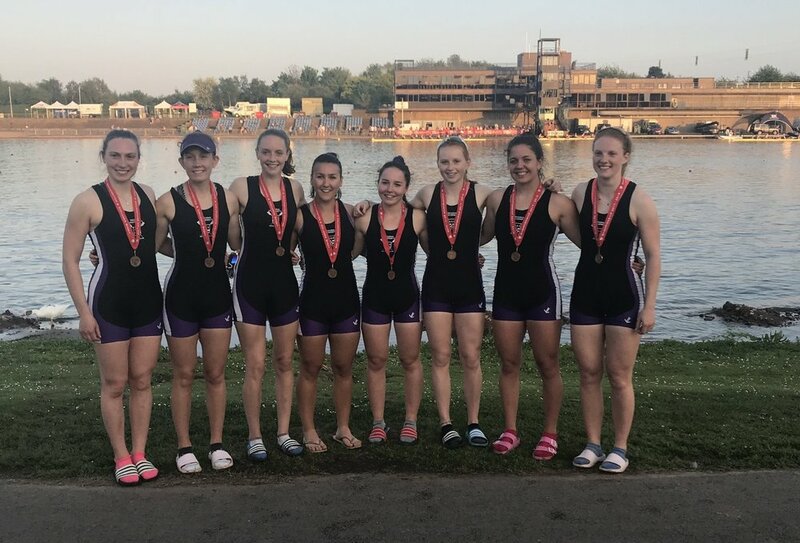 The Champ women’s quad of Chloe Knight, Lucy Ryan, Fran Bratt and Anna Smart also attacked their race, fending off Cambridge University in the final stages and winning a bronze medal. Sunday continued in the same theme as Saturday with the men’s doubles and women’s singles performing well. Victoria Norton and Sophie Lewis, our two women racing in the intermediate lightweight category placed fourth in the B and C finals respectively. Our champ lightweight sculler Chloe Knight raced well to place fifth in a tough field. Lucy Ryan fought hard throughout her race to come away with a fourth place. We also had three scullers entered into the women’s heavyweight intermediate category, they all raced in the B final with Fran Bratt coming second, Bea Roe fourth and Charlotte Bawn fifth. Our men’s doubles rounded out the day in style with medals in every event. First up was the lightweight double of Sean O’Mahony and Franklin Hamilton who came away with a silver. Following them down the course were our intermediate doubles. 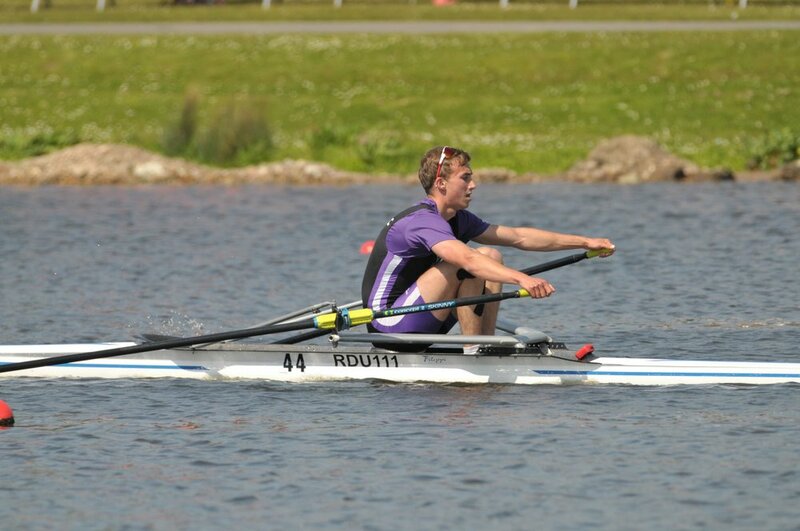 The ‘A’ boat of Olly Dix and Luke Reiser won a gold medal with clear water behind them while the ‘B’ and ‘C’ boats also raced well with Rob McPherson and Laurence O’Conner coming fourth and Alex Badcott and Ollie Irwin placing fifth. Last, but by no means least our champ double of Rory Harris and George Lawton won us another gold medal after a big sprint for the line. Kicking off the last day of racing was our women’s lightweight quad of Sophie Lewis, Anna Smart, Emily May and Vic Norton. They attacked the race hard, battling with Exeter University throughout, placing sixth in the A final. Next up were the women’s intermediate doubles where we had three boats entered. Franky Bailey-Tait and Molly Regan placed second in the D final, Charlotte Bawn and Hettie Horler came first in the C final and Fran Bratt and Bea Roe came away with an impressive gold medal. Our champ double of Chloe Knight and Lucy Ryan won a well-deserved silver medal after rowing through Edinburgh on the line. Some of the beginner men from the quad on Saturday also raced well, but unfortunately did not qualify for semi-finals. Also racing on the Monday were our men’s quads. Our intermediate boats raced impressively to come away with two medals! It was a bronze medal for our ‘B’ boat of Rob McPherson, Ollie Irwin, David Few and Harvey Jacklin while our ‘A’ boat of Sean O’Mahony, Luke Rieser, Laurence O’Conner and Alex Badcott won the gold. A fantastic result for RUBC to have two quads in the A final! Our champ men’s quad, made up of athletes from the medal winning doubles from Saturday (Franklin Hamilton, Olly Dix, Rory Harris, George Lawton) came away with a silver medal behind a quick crew from Queens University Belfast. Nat Schools Regatta - cheering them on. Success at BUCS Head - RUBC medal in every event entered!